Want a sense of the new world we’re seeing here in Nevada, thanks to licensed and regulated online poker? Game-wise, the combo of WSOP.com and Ultimate Poker is still hardly a shell of the glory days of PokerStars and Full Tilt. But what is different is the way online poker is showing up around town … on billboards, TV, radio … in snail mail, on top of slot machines … I’m kinda waiting to see it show up at the 50-yard-line at Sam Boyd Stadium — because really, shouldn’t there be a WSOP.com Silver Bowl? Until then, however, the WSOP is left to consider other means to present their brand (and an entire industry!) with newfound legitimacy. 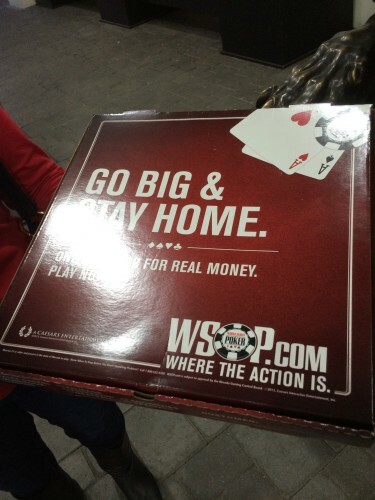 According to the presumably reliable delivery driver from Noble Pie Parlor in Reno, WSOP.com provided some 500 of these boxes for their handmade “New York Street”-style ‘zas.